#SNAPChallenge Day 4 fell on a Saturday and had me hosting dinner for some friends. I woke up today and was not starving, like yesterday. It felt good not to wake up and be utterly obsessed with food. I usually don’t eat immediately when I get up on the weekends – I eat an hour or so after I wake up. Once I started moving about this morning, I was pretty hungry and I had an English Muffin with Peanut Butter and a clementine along with a pint of water. I did quite a few chores around the house then around 14h00 I realized how hungry I had gotten. I steamed some broccoli (I finished the first head today and have a full head left for 3 more days! 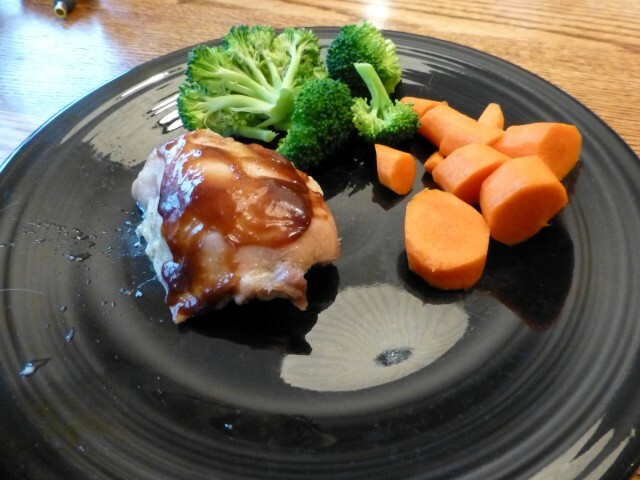 ), cut up a carrot (ate it raw) and reheated a chicken thigh. I decided to put some barbecue sauce (condiment) on the thigh and had a perfectly lovely – yet not filling – lunch. After I cleaned up from lunch, I had to toast an English muffin as I was still quite hungry. For dinner tonight I am hosting a couple friends. Read how I am hosting dinner while trying to remain true to my pledge during this #SNAPChallenge. Four Days Down – Three Days to Go. This isn’t easy. I am looking forward to this Challenge ending and getting back to my real life. I can’t imagine continuing to eat like this for ever. By Tim in Food on January 6, 2013 .